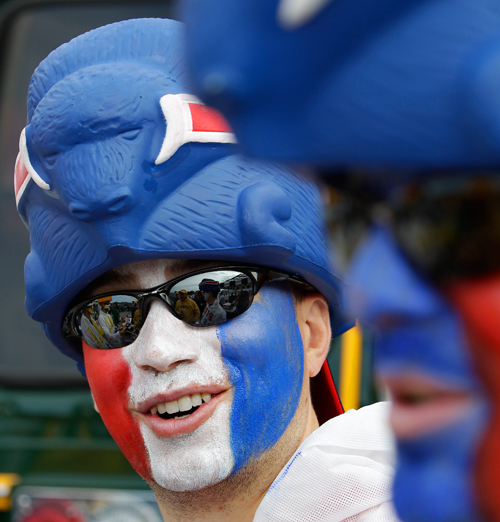 Photos From The Green Bay Packers vs The Buffalo Bills NFL Football Game. 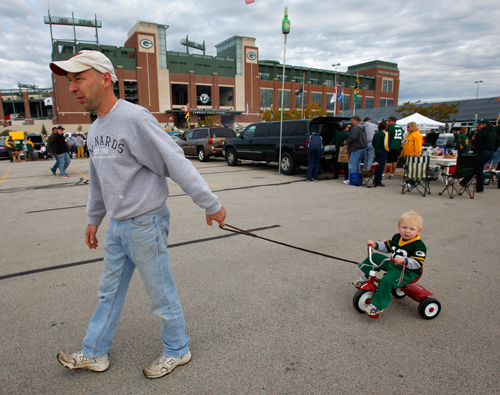 Here are a few of my favorite photos from the home opener for the Green Bay Packers at Lambeau Field in Green Bay, Wisconsin on Sunday, September 19th, 2010. 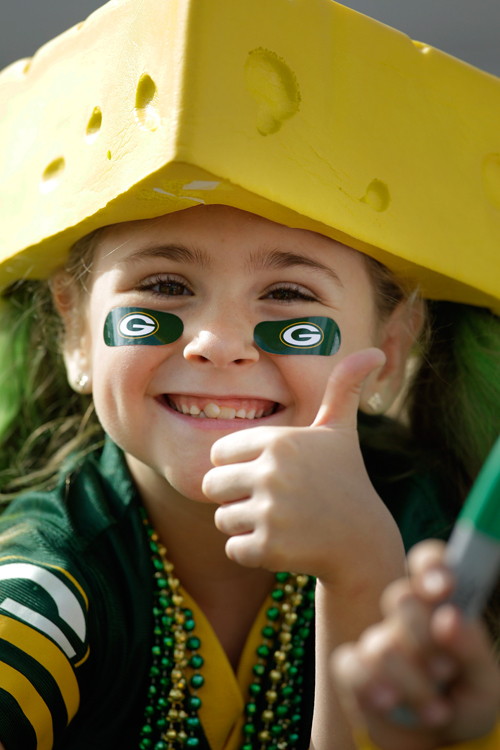 The Green Bay Packers defeated the Buffalo Bills 34-7. In the last few years I have worked harder to get photos away from the action. 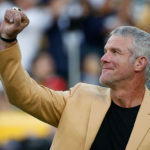 From the fans in the parking lot tailgating to fans in the stands or photos of the players and coaches before the game. I got one of my favorite photos in a number of years when Packers linebacker Nick Barnett decided to show me his fangs as I was shooting a tight headshot of him as he was walking off the field during warm-ups. The fangs are part of his mouthguard. 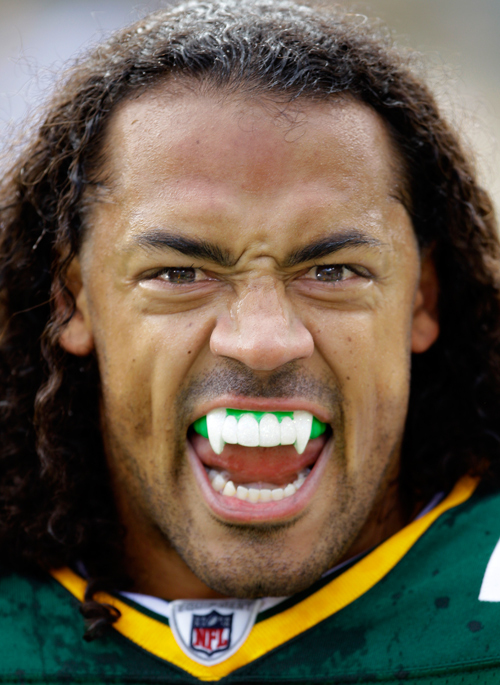 Green Bay Packers linebacker Nick Barnett shows off his fangs before the game. 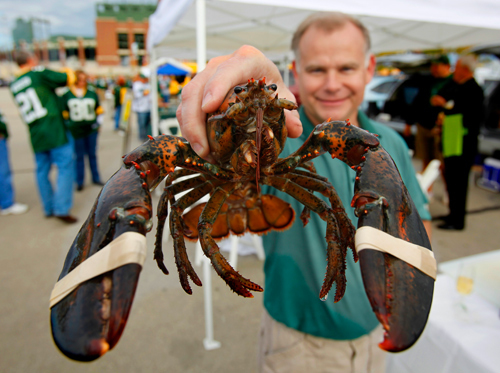 Randy Tess shows off one of the live lobsters he will be boiling up at his tailgate party. Lambeau Field reflects in the sunglasses of linebackers coach Kevin Greene. A flyover of F-16s after the national anthem at Lambeau Field. Green Bay Packers linebacker Clay Matthews takes to the field during player introductions. Green Bay Packers cornerback Charles Woodson waves to the crowd during player introductions. 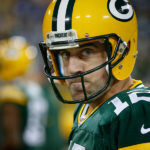 Green Bay Packers quarterback Aaron Rodgers rolls out of the pocket. 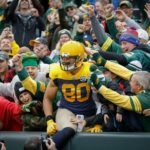 Green Bay Packers wide receiver Donald Driver celebrates a touchdown with a Lambeau Leap. 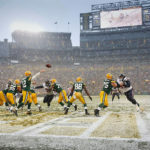 Green Bay Packers quarterback Aaron Rodgers does a Lambeau Leap after running for a touchdown. Buffalo Bills defensive tackle Dwan Edwards tries to pressure Green Bay Packers quarterback Aaron Rodgers. Green Bay Packers linebacker Clay Matthews and Green Bay Packers safety Nick Collins celebrate a defensive stop as A.J. Hawk looks on. Buffalo Bills safety Donte Whitner shows his frustration with a missed interception opportunity. Green Bay Packers place kicker Mason Crosby kicks a field goal. Green Bay Packers cornerback Charles Woodson shows his frustration with a pass interference call. Green Bay Packers cheerleaders preform. Bart Starr waves his cap during Green Bay Packers alumni introductions at half time. Green Bay Packers defensive tackle B.J. Raji pressures Buffalo Bills quarterback Trent Edwards. Green Bay Packers quarterback Aaron Rodgers is taken down by Buffalo Bills safety Bryan Scott and defensive tackle Marcus Stroud. Green Bay Packers linebacker Clay Matthews sacks Buffalo Bills quarterback Trent Edwards. Green Bay Packers linebacker Clay Matthews celebrates one of his three sacks of the day. Green Bay Packers defensive end Jarius Wynn pressures Buffalo Bills quarterback Trent Edwards. 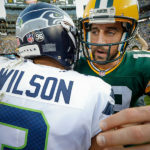 Green Bay Packers quarterback Aaron Rodgers and Buffalo Bills quarterback Trent Edwards shake hands after the game. « Annual Report Medical Photography For Midwest Healthcare Client.